Welcome to the Texas Osteopathic Medical Association! 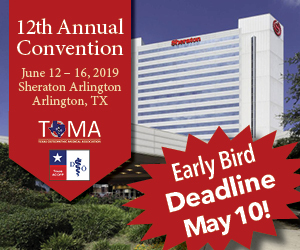 The Texas Osteopathic Medical Association (TOMA) is the oldest statewide Osteopathic Medical Association in the nation. Founded in 1900. this society serves over 1,400 osteopathic physicians and trainees across the state of Texas. Promoting the philosophy of the osteopathic school of medicine. Elevate and maintain the high standards of the osteopathic profession in the fields of medicine, surgery and obstetrics. Promote research in the diagnostic and treatment of disease. Establish and improve upon the high standards of medical education and practice in osteopathic institutions.